According to SocialMediaExaminer, 93% of marketers across the globe use Facebook ads regularly. That is almost every marketer on the planet! And if you think this is just the west, think again. More than 70% of businesses using FB ads are not from the U.S.
That’s enough proof that Facebook marketing can’t be ignored by most businesses. While most business owners who have a digital presence understand this, very few are able to get desired results from such advertising. In a world where social media is evolving every day, it is absolutely necessary to know what works and what just burns money. Most startups invest in Facebook ads without narrowing down their personas, understanding core needs and building a solid messaging. If that sounds like you, this post shall cover the A-Z of FB ads for you. The need for FB ads. How to decide on your personas. Types of ads and how to choose them. Types of bidding models and how to choose them. Analytics and optimisation for ads. Ready? let’s get started with it! #1 Why do startups need Facebook Advertising? A startup is nothing but a company trying to perfect it’s growth model. If that’s not good enough for you, let me convince you some more. When your target audience is spending more than 30 mins per day on an app (FB), you better be there. Another main reason which has fascinated me is the cost-effectiveness of Facebook ads. 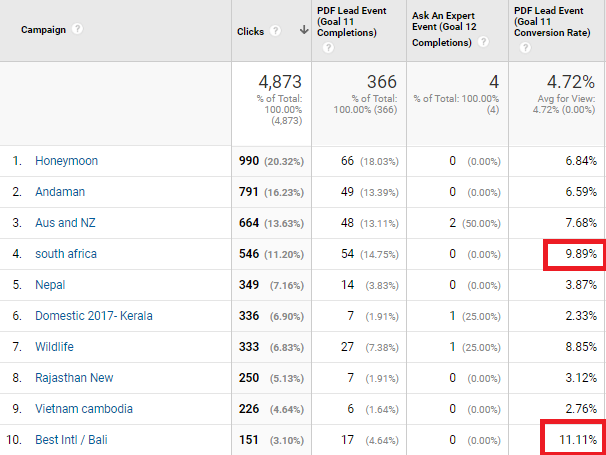 At Marketing Masala, we have run ads with as low as $0.03 per click in western countries and achieved results at $0.14. 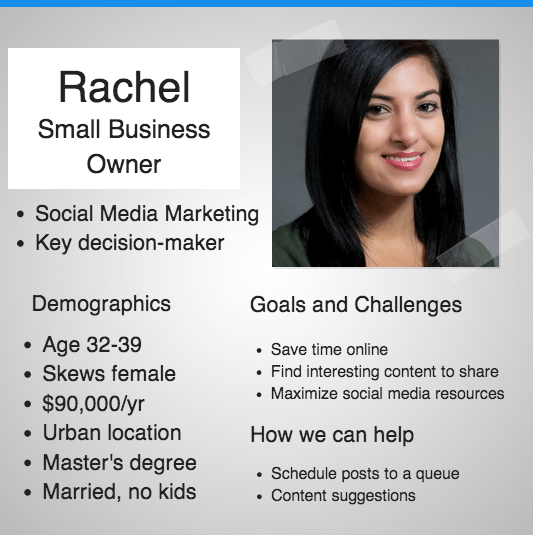 #2 How to narrow down your target audience on Facebook? 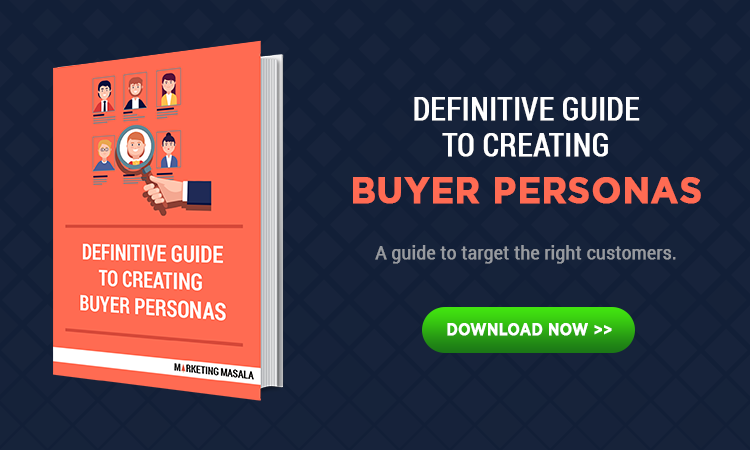 Building a customer persona is the number one step before you begin marketing. Doesn’t matter if it is Facebook ads or something else if you don’t know who your customer is, you can never market them the right way. Here’s an easy template we like to use. This was developed by the good folks at Buffer. As you can see, it is important to understand the demographics of your persona, their challenges and what your message should be to them. Once you have narrowed down your persona, it is time to replicate the same to your Facebook audience. 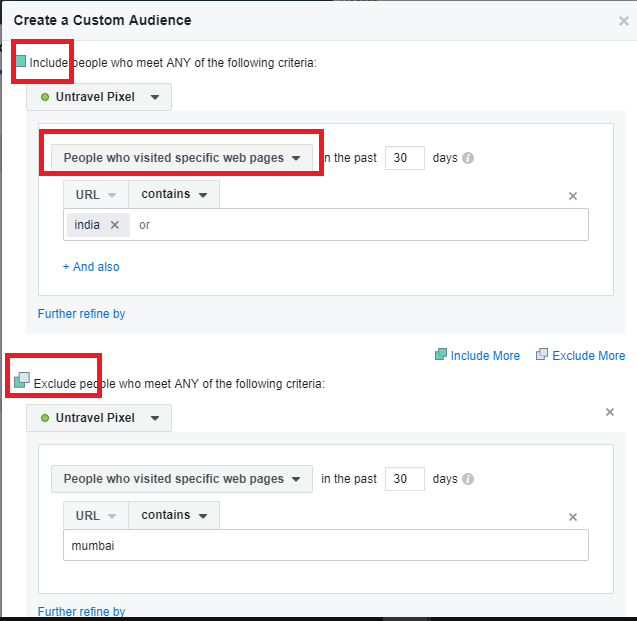 You should get started with Facebook custom audiences and build as many audiences as your personas. Let’s consider a case where we were building an audience for a startup in the business intelligence sector. They have software that lets you understand business insights better. From the tech hubs in the given country. Were designated at job roles who could take a decision on buying the tool. #3 Which type of FB ads to choose? 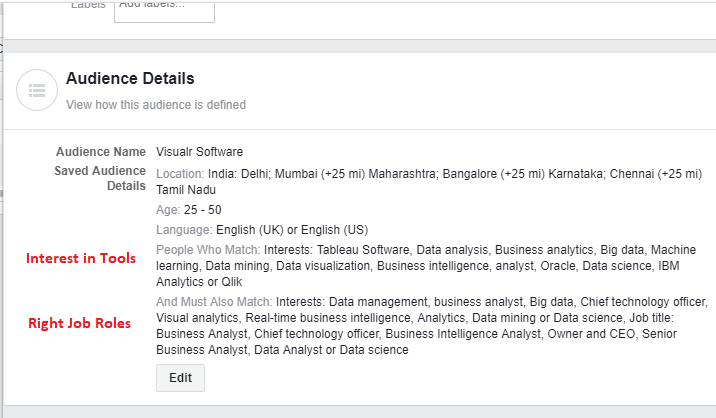 The next part is to understand what kind of ads should you go for when setting up FB Ads for startups. Choosing the right ad types is closely related to your business goals. #1 Case 1 -B2C travel company looking for signups. Facebook gives you a lot of options for bidding. That basically means the way you want to pay for Facebook’s ad services. Cost per impression: Facebook charges based on every 1000 people who view the ad. Cost per click: Facebook charges on the number of clicks sent to your website/app. Cost per result (charged on impressions): Facebook shows ads to people who are more likely to convert but charges you based on the number of impressions. Cost per impression When the click-through rate is very high and cost per click would be costlier. Testing ad copies and targeting is undoubtedly one of the best strategies to improve performance. You should aim for weekly changes in ads/targeting for optimum performance. Here are some of our results when we do split testing with ad copies. You can see that the best ad is costing us 1/4th of the worst performing ad. Try a different message each week- text and image. Shift the type of creative- banner, carousel, videos etc. Target to a different audience- try shifting genders, age groups and more. Understand which audience and copy are getting the best results. A facebook pixel is no different from a google analytics code. It is a piece of code that you can paste in your website and it will track user activity. Once you have done the above, you should be looking forward to creating remarketing lists. Remarketing lists are nothing but custom audiences who have visited your site but have not taken a desirable action. One of our clients, a travel company was facing a huge drop off of visitors from their web pages. We decided to create lists of people who were abandoning the web page for a particular travel destination and served them remarketing ads for the same. The sole reason for using remarketing ads is that we live in a world where digital transactions don’t generally happen in one go. Your customer is distracted and has an average attention span of 3 seconds! It is important that you remind them of the products/services they showed interested in and maximise conversions. Whatever you can measure, you can improve. The beauty of digital marketing is that you can track it and constantly optimise. The same is true when it comes to Facebook ads. Build custom links and tracking them in Google analytics. 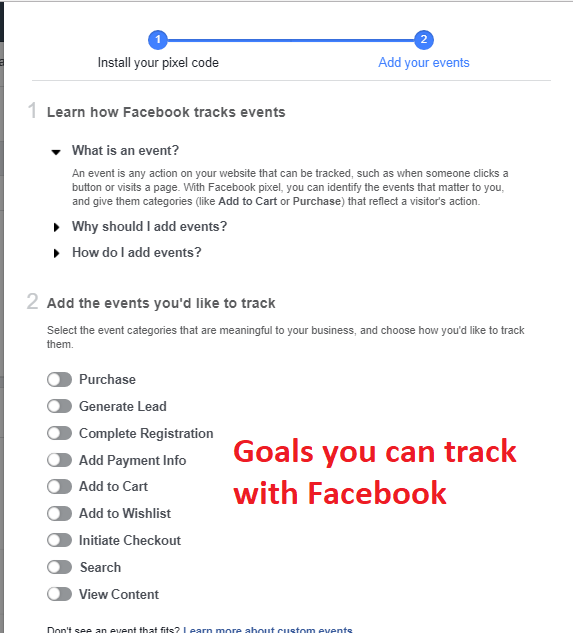 Setting up goal tracking within FB and recording there. Facebook conversion tracking is good but it is still evolving. So we’d recommend you to use Google analytics with it for result tracking. 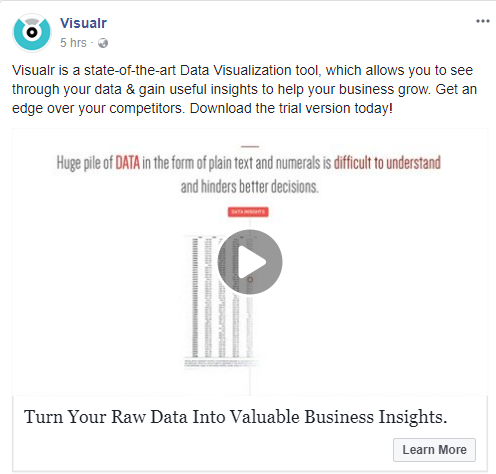 How to set up conversion tracking within Facebook ads? Similarly, you can do the same in Google analytics. Here’s a post on how to set up conversion funnels. Which ad copies are getting results at the desired cost? Which ones are failing you? Within your audience, which age group and demographics are getting better results? What time of the day are visitors converting best for you? 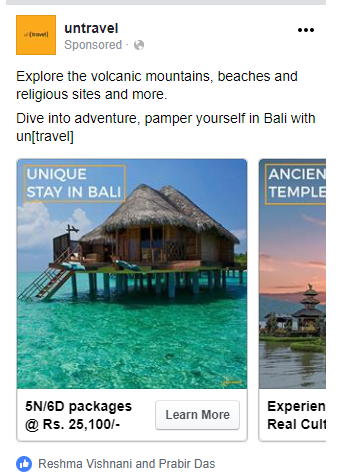 What do the comments in your FB ads say? Is there any feedback you can collect there? Your messaging to that audience. Which KPI’s matter most to you. How will you track and improve them? It’s critical to work around a framework or else you can get lost very easily. You can have a look at our case studies below to know more.